Buy ParanormalHousewife a Coffee. ko-fi.com/paranormalhousewife - Ko-fi ❤️ Where creators get paid by fans, with a 'Buy Me a Coffee' button. Kelly is the blogger behind the Paranormal Housewife. She has been a paranormal investigator for over 15 years. She received her initial training in how to ghost hunt from the Rhine Research Center's paranormal team. 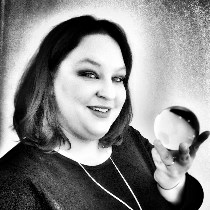 Since leaving their team she spent over 10 years training other teams across North Carolina how to ethically ghost hunt, capture quality evidence, and provide better customer service when helping people that approach them about possible issues with spirits in their home or business. With the rise of ghost hunting shows, Kelly wanted to make sure that anyone who has an interest in ghost hunting knows how to do so in a safe manner for both themselves and the spirits. Secured Payments. Support goes to ParanormalHousewife's account. Upgrade ParanormalHousewife to a yearly Gold Membership with a one-time payment.